In the past, employers and employees knew each other, worked in the same office and of course, in the same cultural context and time zone. Today, as remote offices, mobile technologies and peer-to-peer recruitment platforms converge, a growing number of businesses have no physical base at all and in some cases, employers and employees never meet face-to-face. This situation raises a myriad of new possibilities and challenges for workplace training. Jonathan Klein is a 32-year old project manager. His company specializes in building websites that in turn generate revenue through advertising. His business has taken off because he has a gift for recruiting and retaining employees who can create exceptional SEO content and attractive and interactive websites. Indeed, over the past five years, his business, once a do-it-yourself operation, has turned into a full-time business with over 18 employees. Klein’s employees include full- and part-time writers and website designers and because he recruited all of them online from peer-to-peer employment sites, like Elance and ODesk, his employees live in seven countries, five time zones, and ten different cities. Klein touches base with his employees from time to time via email or Skype chat, uses DropBox to collect work in progress and deals with weekly payments online. He has never met a single one of his employees and likely never will. Moreover, none of his employees, who regularly collaborate to build his sites, have met each other either. Klein is part of a new generation of managers who works remotely, often in his pajamas and sometimes in much less, with his dog at his side. He supervises a work team dispersed across locations as far afield as Shanghai, Toronto, New York, Dublin and Istanbul. He’s part of the new world of work, and it’s a world where regular office hours, shared office spaces and in-person relationships are no longer required. But does swapping the traditional workplace for a remote work team necessarily mean abandoning training? Not according to Klein. 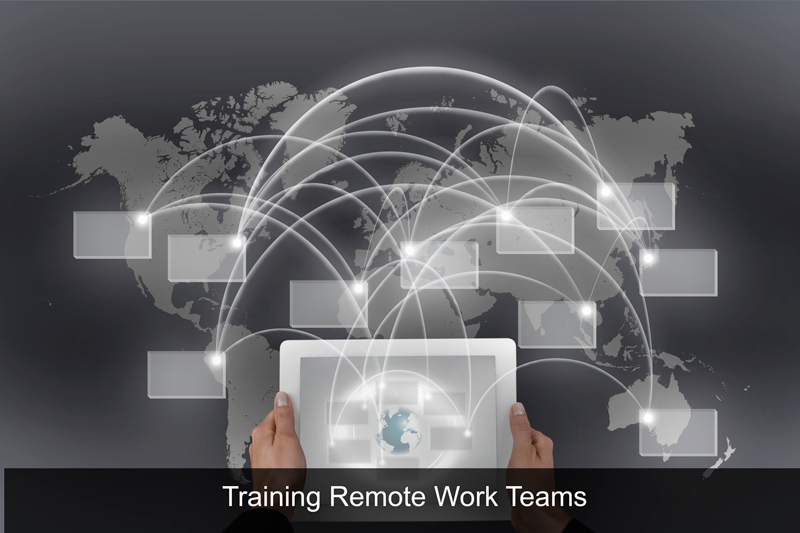 Over the past two years, Klein has identified several training issues and started to implement flexible training solutions for new and existing team members, despite the fact that he works with an entirely remote workforce. Solutions include crowdsourcing expertise from his existing team and developing a mutual mentorship program to help on-board new hires. In addition, he has taken steps to mitigate problems by promoting cultural sensitivity and flexibility through his training program. Crowdsource expertise: Virtual work teams are often comprised of workers who have taken on a second job (e.g., something they do after their regular work hours). For this reason, in some cases, one’s remote work team is comprised of workers who are more rather than less qualified. Find ways to crowdsource solutions, including solutions to training problems, by making the most of the expertise and skills already on hand. Create a mutual mentorship program: On a related note, pair new employees with existing employees to facilitate the on-boarding process. While new employees benefit from ongoing feedback as they integrate into the work team, existing employees benefit from the opportunity to break the isolation of working remotely. Promote cultural sensitivity: Remote work teams are increasingly comprised of workers from around the world. For this reason, cultural sensitivity training can be more important than ever before. A work team comprised of workers from India, Japan, Australia, Canada, Ireland and the United States, for example, will invariably be comprised of employees who celebrate different national and religious holidays. In a virtual workplace, simply knowing when to expect co-workers to be available and online can make a huge difference in mitigating misunderstandings. Embrace flexibility: Many people prefer to work remotely, because it is a way to work on a flexible model. It goes without saying that any training solutions for remote workers need to be as flexible as the job itself. For this reason, mobile training options are a natural option—they can be completed anytime and anywhere, usually in modules that take only 5- to 10-minutes to complete.